If you’re intent on getting married on a national holiday, you can’t do much better than Valentine’s Day. This year, more than 6 million couples are expected to get engaged on the day we’ve come to associate with the celebration of love and affection. It’s only natural that a few thousand of you wed-to-be’s will celebrate the occasion by booking your wedding on Valentine’s Day the following year. And we think that’s great. The only problem is that getting married on Valentine’s Day can present some difficulties when it comes to decorating your ceremony and reception. Do you decorate it like a wedding with white garland and lace? Or do you dress it up like a Valentine’s Day party and stick hearts on everything? Well we’ve got a proposal for you – Why not do both? Decorating a Valentine’s Day wedding might have been tricky in the past, but thanks to the rise of Pinterest and up-and-coming army of crafty wedding blogs, it’s a cinch to curate a collection of wedding décor that celebrates both you as a couple and the holiday that you love so much. Even better- many of these decorations can be done by you and your fiancée, which should give you a little more cash to spend on that honeymoon you’ve always dreamed of. To help get you started, we’ve curated our favorite love-themed nuptial projects from around the web right here in a comprehensive tutorial. Grab your scissors, kids, because things are about to get crafty at this reception. 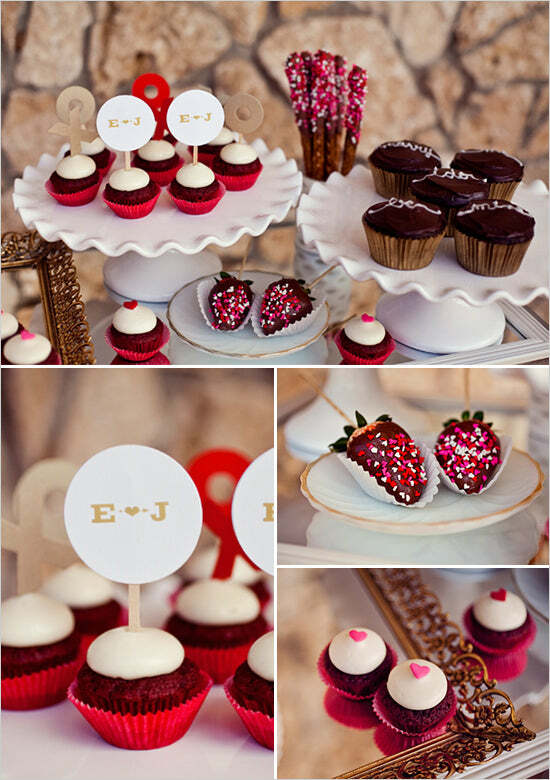 Weddings and cupcake tables go together like… weddings and wedding cake. Maybe we could have thought up a better simile, but the point is that cupcake tables are incredibly popular wedding features these days. And if you happen to be getting hitched on Valentine’s Day, you’d be smart to model your own cupcake table after this awesome spread by Hawaii-based wedding planners Opihi Love. This classy cupcake table takes the minimalist approach, using solid colors and simple designs to create an edible display that just screams elegance. Check out the full gallery over at Wedding Girls. The ring bearer pillow is one of the more neglected aspects of wedding décor. Many couples just settle for a stock model or whatever pillow is provided by their wedding planner. But we both know that you’re better than that. 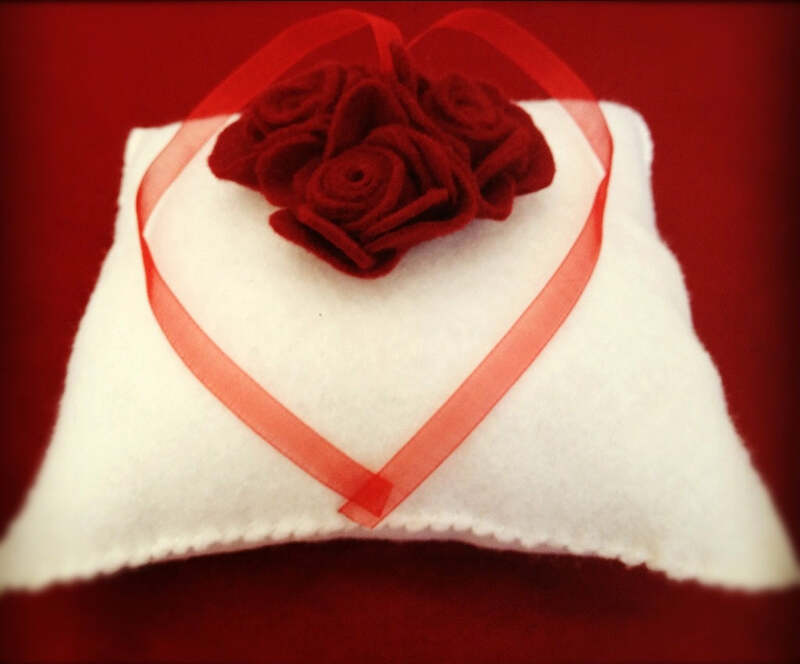 Add a dash of Valentine’s flair to your wedding by sewing your own Valentine’s-themed ring bearer pillow using this great tutorial by Brittany of Mama’s Felt Café. It’s easy to do and should make for an awesome keepsake to show your grandchildren one day. Get the step-by-step tutorial at Mama’s Felt Café. Make a statement with your centerpieces by whipping up a batch of these amazing paper Valentine’s fortune cookies for your reception tables. They’re chic, they’re easy to make – you just need craft paper, some takeout boxes and a pair of scissors – and your guest will love opening them to see what personalized fortunes you’ve hidden inside. A word of advice: if you’ve got a lot of tables to decorate, you may want to consider enlisting some friends and family to help out. Otherwise you’re going to be cutting for a while. Get the full tutorial at Bridal Cookie. We love these DIY Fabric Book Cover Place Cards by Desiree Spinner Events. 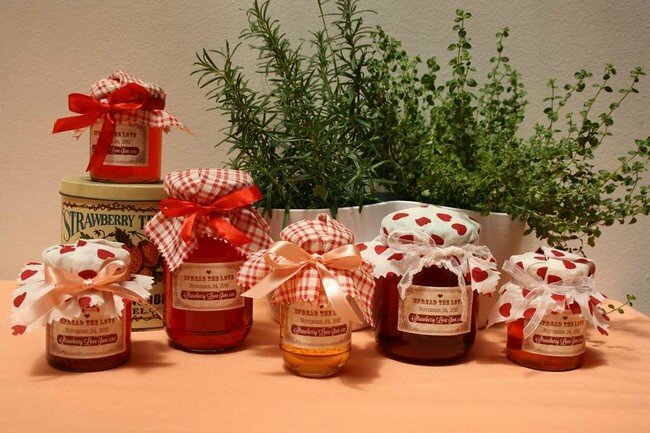 They’re super creative and on top of that, they make excellent favors for your wedding party. Here’s a brief overview on how to make them for your wedding: First, purchase a book for each groomsman and bridesmaid. 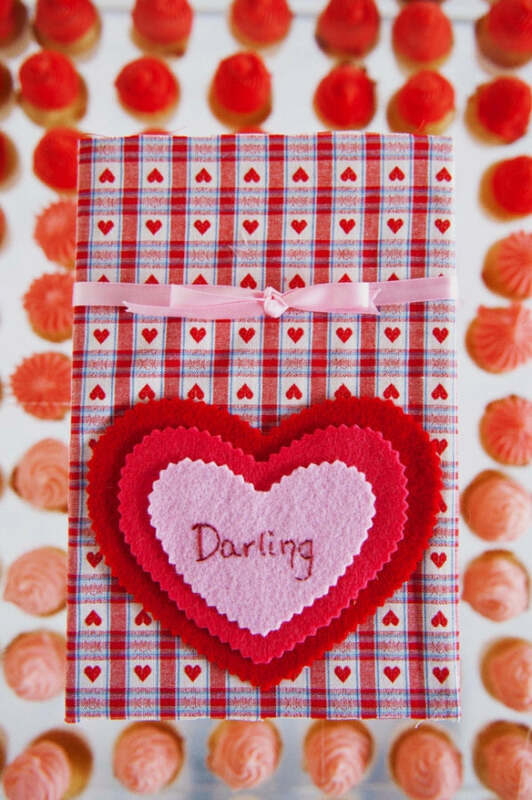 Then decorate the books with Valentine’s Day themed fabric. Add a personalized name tag and some ribbon and voila, you’ve got a set of place cards that will melt the collective hearts of your wedding party. Check out the full tutorial from Desiree Spinner Events at Ruffled. Jessica May contributed a ton of great Valentine’s Day Wedding ideas to Green Wedding Shoes, but our favorite projects by far are the Valentine’s embroidery hoops. You can get these hoops dirt cheap at your local fabric store. Then, using a few stamps and patterns, you can turn them into an awesome decorative collage that doubles as a lovely backdrop for reception photos. Check out the full gallery at Green Wedding Shoes. These crafty felt heart drink and cupcake toppers might be the most adorable things we’ve ever seen. 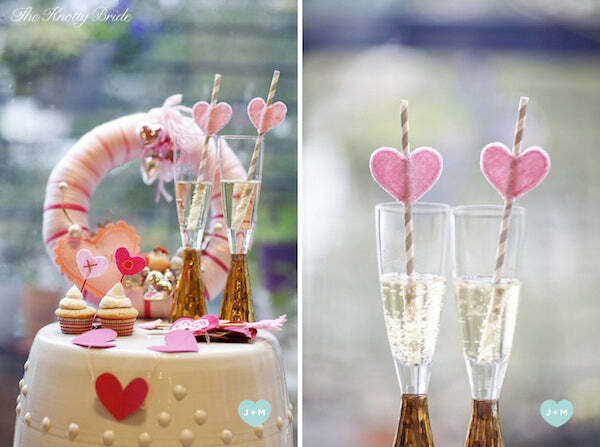 They’re easy and affordable to construct, making them a must-have at any Valentine’s-themed reception. You just need a sheet of felt, some scissors and a hot glue gun and you’re in business. If you’re feeling extra crafty, you can also embroider them with X’s and O’s for extra unbearable cuteness. Get the full tutorial at The Knotty Bride. Want an awesome set of wedding toppers but lack the time or acumen to craft your own? Never fear – Nikki from Paper Gravy has you covered. She’s giving away this awesome set of Beatles-themed toppers, bottle labels and buffet flags as a free printable on Graphics Fairy. Just follow the link, print them out, cut “˜em up and decorate your reception accordingly. It doesn’t get much easier – or prettier – than that! 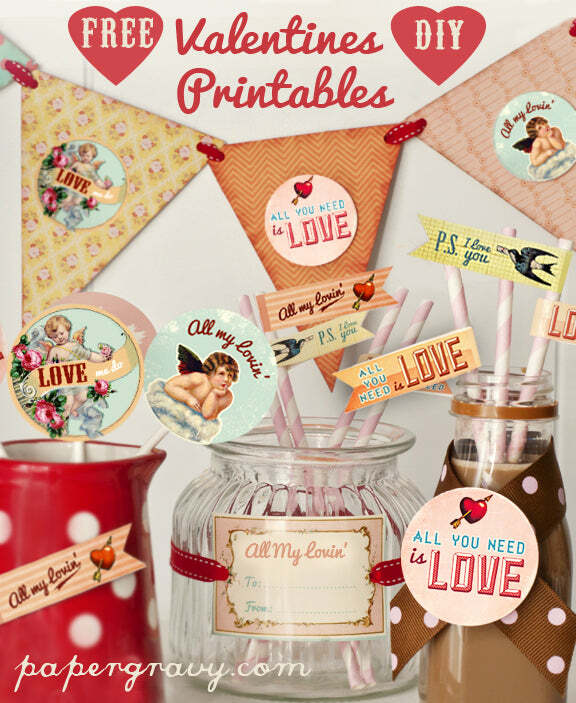 Let your guests know that “Love is all you need” and download the toppers at Graphics Fairy. 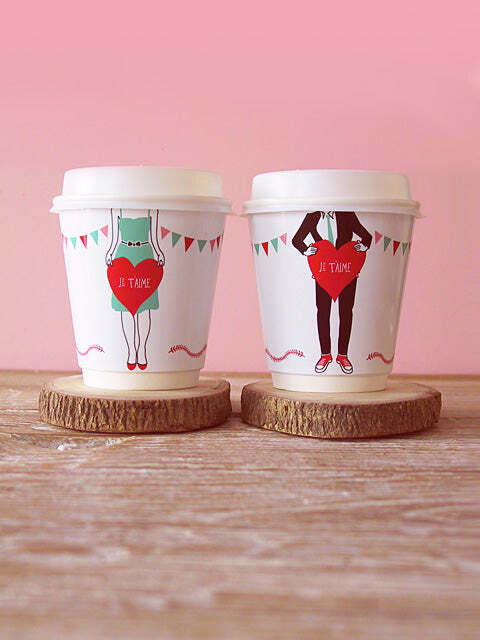 Now, you might be asking yourself why a Valentine’s Wedding needs to feature customized paper coffee cups. That’s totally understandable, and we’ve got a totally understandable answer for you – because they’re versatile. You can use romance-sleeved cups as collection trays for your guestbook entries. You can stuff them with gifts and give them away as favors. You can use them as containers for your candy buffets or you can, you know, use them as coffee cups. Whatever tickles your fancy – we’re not here to judge. Get the printable at Eat Drink Chic. Every wedding needs decorative garland. 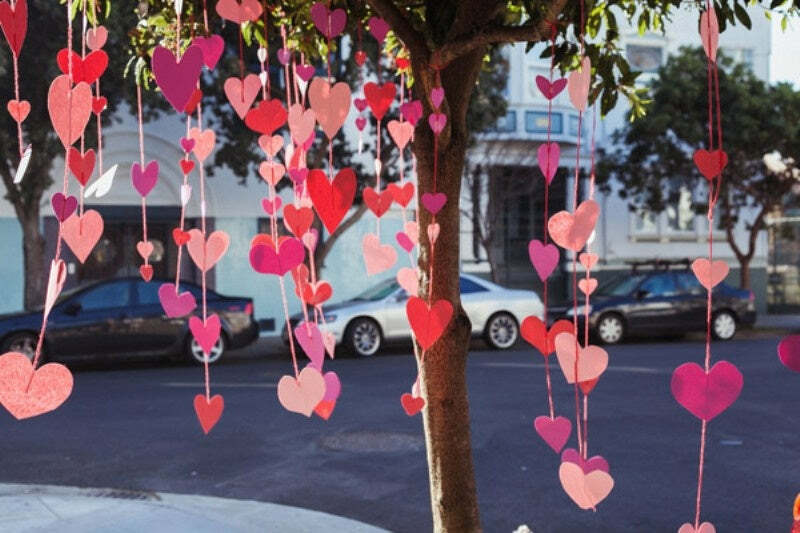 If you’re tying the knot on Valentine’s Day, then your garland better be cute and full of hearts. Luckily, the gals at Weddingomania have you covered. Use their tutorial to whip up a heart-themed garland that you can hang as decoration, drape from your dinner table or use as a back drop. 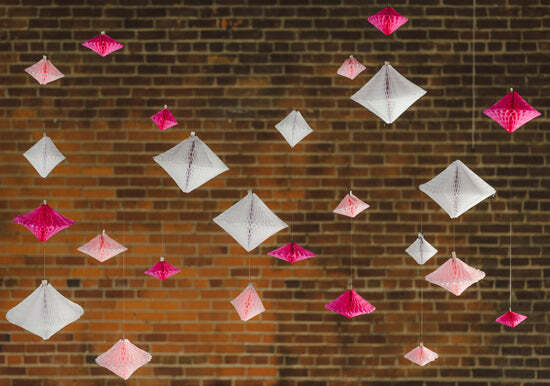 All you need to make it is some string, some construction paper, some tape and a few hours of free time to create some of your own. Get the tutorial at Weddingomania. No wedding is complete without a signature cocktail or two – and when it comes to Valentine’s cocktails, you won’t find anything sweeter than the Chocolate Marshmallow Cocktail. Made from marshmallow fluff vodka and rimmed with chocolate and sprinkles, it’s a sweet treat that your grown-up guests are going to love. While we’re on the topic of signature cocktails, we’d like to introduce you to the Sweet Valentine by Bayside Bride. 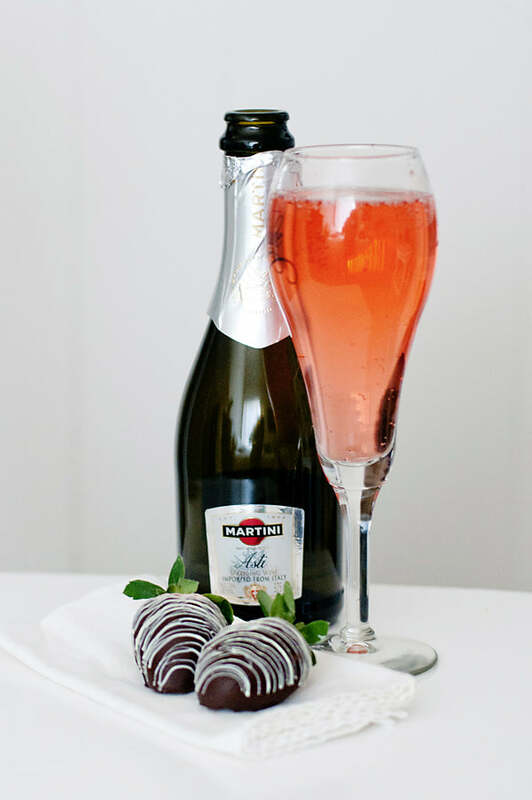 A classier alternative to the chocolate marshmallow cocktail, this pink Valentine’s Wedding drink should make a delicious and decorative addition to any holiday wedding. Made from champagne, Mountain Dew and Grenadine, it’ll help keep your guests up and partying all night long. Get the recipe at Bayside Bride. Not everybody makes their own jam. We’re not going to judge you if you don’t. However, if you’re one of the awesome people that do – or if you just have access to a large supply of homemade jam – then you should really consider giving it away as a favor with these custom jar labels from Confetti Day Dreams. Your guests will love them and all of your other engaged friends will be totally jealous – and really, isn’t that what weddings are all about? Spread the love and download the free printable from Confetti Day Dreams. Sometimes simple is beautiful, as is the case with these awesome personalized centerpieces from Posh Posh. 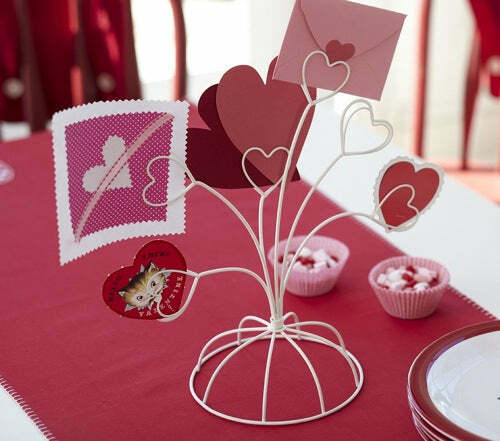 You’ll have to buy the heart-themed wire centerpieces online, but from there you’re free to customize them however you see fit. Add snapshots of your journey as a couple, decorative patterns, inspirational quotes – it’s totally up to you. Check them out at Posh Posh. 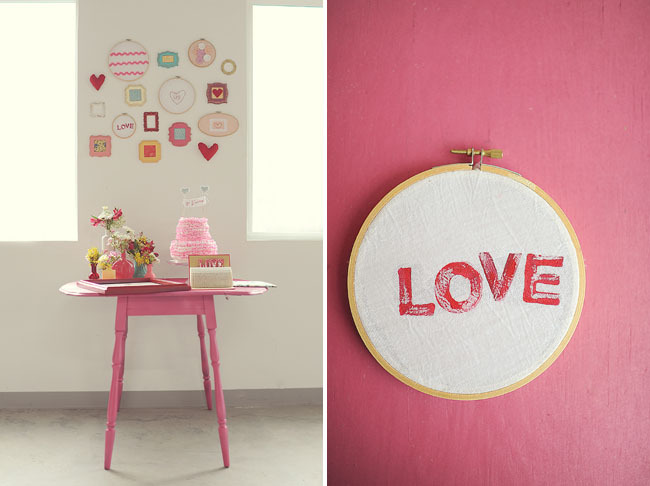 This honeycomb geometric Valentine’s Wedding backdrop from Confetti pop is absolutely awesome. Made from cutout honeycomb paper diamonds, it isn’t as traditional as other Valentine’s Wedding Décor we’ve included on this list – but thanks to its holiday color scheme, it should fit flawlessly into your theme. And seriously, look at that thing. How cool is that? We would totally want that at our Valentine’s Wedding. Get the tutorial at Confetti Pop. 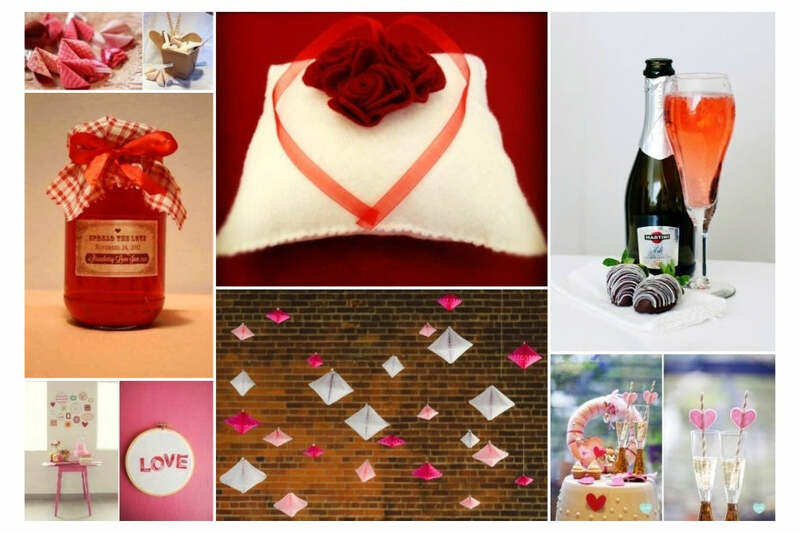 Did you find a project in our Valentine’s Day Wedding Idea Compendium that you plan to use for your V-Day Wedding? Do you have a great wedding décor idea that we forgot to mention? Then let us know! We’d love to hear from you in the comments and if you’ve got something cool up your sleeve, we’d love to feature it in a post on the ACS Blog!